Vincy used a 104 run partnership between captain Bront DeFreitas and Monty Butler—after both were dropped—to upset unbeaten and defending champs Grenada, preventing them from becoming only the second team to win successive BVI Cricket Association FLOW Twenty 20 titles on Sunday in Greenland. By winning the Premier Division—after struggling at 46 for 6—Vincy walked off with the inaugural A. O. Shirley Shield. In the process of scoring their 150 for a four wickets victory in reply to Grenada’s 149—after being 45-6 at one point—Vincy joined Cavaliers as only the second team to earn two titles in the shorter version of the game. 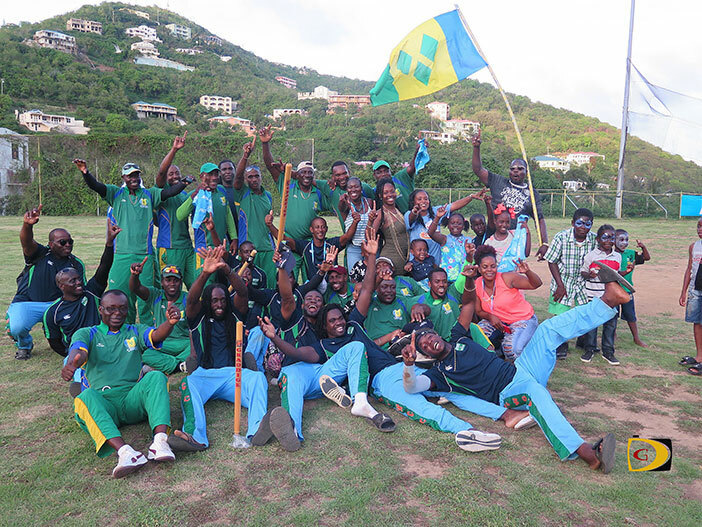 Vincy ended Cavaliers’ 4-year reign in 2013. Grenada’s wicket keeper Raymond Charles—who had a patient 52 to help stabilize their innings—said several dropped catches turned the game for his opponents. “Vincy bowled well, but we also had a couple bad overs and that also helped to turn the game,” he noted as they also missed two key bowlers including captain Derol Redhead. In Division I, After Sylvester Mitchell was bowled for a duck off the first ball he faced, Austin McDowall came in a blasted a stroke filled 164 with 15 sixes and 11 boundaries as Road Town Wholesale posted 261 for 3, then bowled out Virgin Gorda United for 198, to win by 63 runs. Joel Williams contributed a supporting 64 not out.